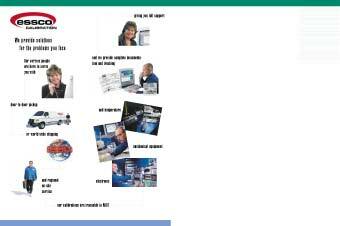 ESSCO Calibration Lab provides calibration of many types of equipment. for a variety of industries. 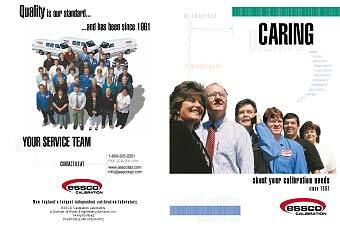 ESSCO needed a new look for its' company and along with a new logo, a pocket folder with inserts was ordered. Keeping with ESSCO's reputation of service, the direction of the folder was with people and their commitment for service. The overall clean look goes well with the need to look precise and accurate. Photography was provided by Rudy DeLellis of Commercial&Advertising Photography. Working closely with Art Director, Brian Sullivan, location shots were carefully timed and executed to layout. Photoshop was used extensively to duplicate the vans, knockout backgrounds and correct other issues.